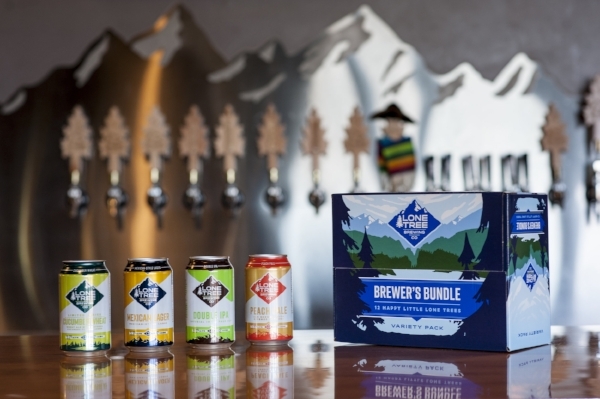 LONE TREE, CO — Lone Tree Brewing Company is proud to announce the addition of mixed Brewer’s Bundle 12-packs to their lineup of year-round packaging. Twelve-packs will be hitting stores this week with an all-star line-up of beers including Mexican Lager (2017 GABF® Gold), Peach Pale Ale, and Double IPA. The packs will also feature a rotating seasonal release beginning with Lone Tree’s refreshing Cucumber Wheat. The first of batch of Brewer’s Bundles include the following beers, which are all also available across Colorado in canned 12 oz. 6-packs. A large percentage of flaked corn contributes a slight sweetness balanced with a clean, crisp finish. 2017 Great American Beer Festival® Gold Medal, 2015 Great American Beer Festival® Silver Medal. Our in-house pale ale recipe brewed with real peaches. Subtle fruit flavor complements the Cascade, CTZ & Simcoe hop additions. Cool, crisp cucumber flavor bolstered by a pale wheat malt backbone. Seasonally available April through September. The new packaging displays the Brewers Association Independent Seal. Lone Tree mixed 12-packs are available at the brewery’s tasting room and can be found across Colorado later this week. For more information about Lone Tree Brewing and their mixed 12-packs contact Emily Hutto at coop@radcraftbeer.com.